A stoppage-time equaliser from Kenwyne Jones cruelly denied 10-man Norwich victory in their first Premier League match at Carrow Road in six years. 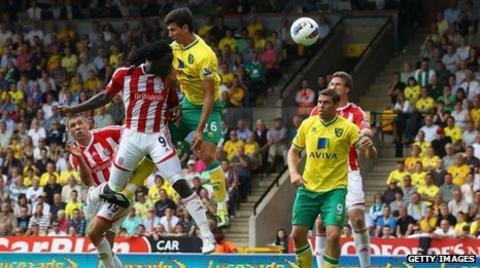 The Canaries took the lead after a shaky start when Ritchie De Laet headed past Asmir Begovic in the 37th minute. Leon Barnett was harshly sent off for a foul on Jon Walters, who then had the resulting penalty saved by John Ruddy. But Jones, a summer 2010 signing from Sunderland, broke Norwich hearts with a headed leveller deep into injury time. Stoke started brightly despite their Europa League match in Switzerland on Thursday. Jones and Jermaine Pennant, who later limped out of the game with a knee injury, combined to tee up the first chance of the game for Walters, but the Republic of Ireland striker's shot was easily gathered by Ruddy. Norwich responded as the half wore on with Elliott Bennett in particular causing Stoke's backline problems. And it was a foul on the summer signing from Brighton that led to the opening goal in the 37th minute. Jonathan Woodgate was rash with his tackle and was booked by referee Neil Swarbrick. Bradley Johnson lofted the resulting free-kick into the Stoke box and fine movement from De Laet, on loan from Manchester United, allowed him to head past Begovic. Woodgate then almost put through his own net when he deflected a cross from Bennett goalwards, but Begovic scrambled it clear. Stoke started the second half strongly and turned the screw as they pushed for an equaliser. Matthew Etherington came close with a curling free-kick from 20 yards that Ruddy did well to tip over the bar. The game's most controversial moment soon followed when Barnett was dismissed. The Norwich man tangled with Walters outside the area but Swarbrick pointed to the spot and showed the Canaries defender a straight red card. Walters, formerly of Ipswich, took the penalty but Ruddy saved superbly to his left before pumping his fists to the delighted Norwich supporters. Defender Daniel Ayala, an £800,000 signing from Liverpool, was brought on by Lambert as Stoke continued to press hard. The Spaniard, along with De Laet and Ruddy, offered stubborn resistance, although Jones was guilty of a horrible miss when he put an effort from seven yards high into the stands. But he made amends in time added on when Etherington pulled back a ball for Glenn Whelan to centre, and Jones beat Ayala in the leap to head past Ruddy and give Tony Pulis's side a point. "The performance was excellent, we played really well. The penalty, although it was saved, changed the course of the game with the sending off. It was miles outside the box, it wasn't a penalty. I'm frustrated we didn't win it." "The first half we were slow out of the blocks, but we worked hard second half and we had chances even before they had a man sent off. To play in Switzerland on Thursday then Norwich on Sunday was difficult but the players' attitude was fantastic. Second half we can't believe we didn't get a hatful."